The making and shaping of this mixture is pretty quick, but the decorating does need some time so it's an ideal activity to keep the kids occupied. Put the flaked almonds into a large frying pan and toast over a medium heat, tossing regularly, until golden. Remove and set aside for decorating. Line a baking tray with non-stick baking paper and set aside. Toss the pecans, whole almonds and sesame seeds into the same pan and toast in the same way. Tip into a food processor and add the dates, figs, water and mixed spice. Blend for a minute or two until as smooth as possible, scraping down the sides once or twice. Divide the mixture into 12 even-sized pieces, about 35g each. Take one piece, flatten it slightly in the palms of your hands and place two ends of one piece of string or ribbon in the centre. Form the mixture into an egg shape, enclosing the string and with the loop coming upwards through the pointy end of the egg. Repeat to make all of the shapes, arranging them on the lined tray as you go. Taking one egg at a time, press the tips of toasted flaked almonds at an angle into the mixture in a row around the bottom. The almonds should be pointing upwards. Repeat with the next row and so on until it’s completely covered. Gently press the whole pinecone in between the palms of your hands to ensure the almonds stick to the dough. 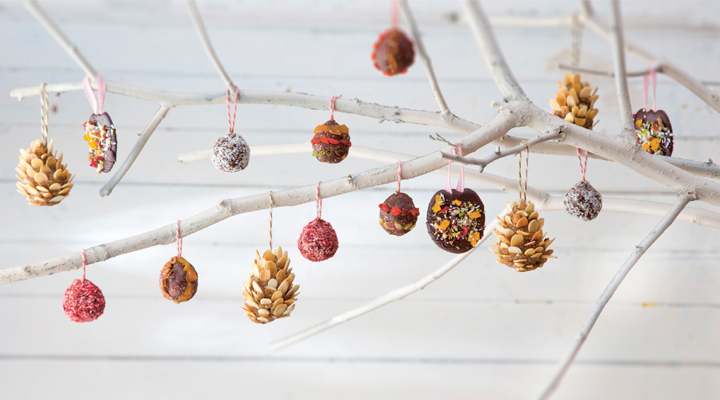 Repeat until all the pinecones are decorated. Cover with cling film and chill in the fridge for 1 hour, until firm. These will keep for up to a week layered between parchment paper in an airtight container in the fridge.